This chapter addresses issues considered to be problematic in grammar instruction, first by presenting a discussion of the nature of English grammar instruction for communicative purposes and then proposing a grammar teaching model that can be used dynamically to improve pedagogy. 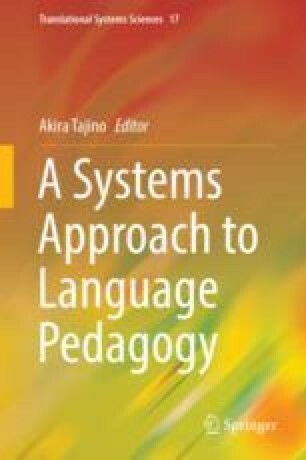 This chapter follows the procedure of soft systems methodology, which is often used to improve situations judged to be problematic: in this case, the instruction of grammar in EFL/ESL contexts. To this end, the chapter first attempts to identify the situation that is seen as problematic in grammar instruction; second, to make a purposeful activity model judged to be relevant to this situation; third, to discuss the desirability and the cultural feasibility of the model when applying it to the real-world situation in the EFL context; and, finally, to take action to improve the situation and revise the model. In other words, the outline of this chapter reflects that of the soft systems methodology procedure itself. In this way, it is possible to see how English grammar might be arranged so that it may be taught systematically and dynamically for communicative purposes. This should bring about systemic change in grammar instruction, shifting the focus from grammar-for-explaining to grammar-for-use. Smithers, R., & Gray, J. (2018). Enhancing the quality of life in lifelong learners: The influence of a meaning-order approach to pedagogical grammar on motivation and self-efficacy. Applied Linguistics Review, 0(0), 1–21. Retrieved 23 Nov 2018. https://doi.org/10.1515/applirev-2017-0095.